Sitecore runs a Lucene index optimization each time an item is updated (e.g. saved). Optimizing a large index is an I/O intensive task and can take a while to complete. During optimization the index is locked. When editors change content at a higher rate than the optimizations are completed, the optimization tasks queue up, hogging system resources. A quick fix for the problem is outlined below. If anyone knows of a better way to solve this issue, please let me know. Override the Sitecore.ContentSearch.LuceneProvider.LuceneIndex implementation used by the indices sitecore_master_index and sitecore_web_index. Override the Sitecore.ContentSearch.LuceneProvider.LuceneUpdateContext implementation and “disable” the Optimize() method. Implement an agent which optimizes the indexes with regular intervals; we’re going to use the existing scheduled index optimization task as inspiration (Sitecore.ContentSearch.Tasks.Optimize). This article is based on Sitecore 7.5 rev. 150130. It’s necessary to override the LuceneIndex implementation in order to return our custom IProviderUpdateContext. The UpdateContext implementation shown below disables the Optimize() method. It still provides the means to run an actual index optimization via the OptimizeIndex() method, which will be called from the index optimization agent. /// Does not optimize the index. Use <c>OptimizeIndex()</c> instead. Sparingly. The OptimizeIndex agent works with any implementation of the IProviderUpdateContext interface, but does an additional type check in case the update context is an instance of our custom class. The configuration shown below overrides the LuceneIndex implementation for the Master and Web indices, and sets up an agent which optimizes these indices every hour. Save it in a .config-file in a subfolder of “App_Config/Include/” (e.g. “App_Config/Include/MyCompany/ScheduledIndexOptimizations.config”). Modify namespace and assembly names as needed, and adjust the optimization frequency to your needs. The screenshot shown below shows the default behavior of a clean Sitecore 7.5 rev. 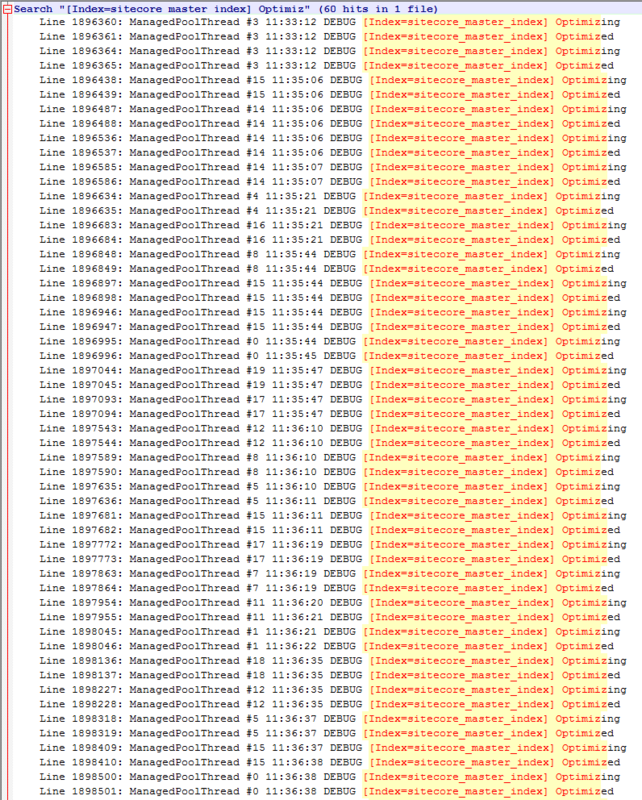 150130 installation, with 1 logged in user (yours truly) making about 5 changes in total. As can be seen from the crawling log, the Lucene master index is optimized a lot, which is fine when the optimization completes in a millisecond — and horrible if it takes longer to optimize than for the next optimization task to queue up. Index optimizations in a barebone Sitecore 7.5 solution. This entry was posted in Lucene.NET, Sitecore, Sitecore 7 Content Search, Sitecore 7.5. Bookmark the permalink. Here is another approach which (I think) just reduces the amount of times the index is actually updated. (i.e not always once for every item save). Maybe this would mean less calls to optimize the index… or could be used in conjunction with your approach to hugely improve performance.